Just a selection of the yellows in the garden . Unfortunately the garden does not look it's best ,having all that heat and dry period ,and then the heavy rains has battered the survivors ! Lovely collage with your beautiful flowers still standing despite the weather. Looks like you're celebrating Geraint Thomas's Tour de France win with all those yellow flowers. He merits them anyway. 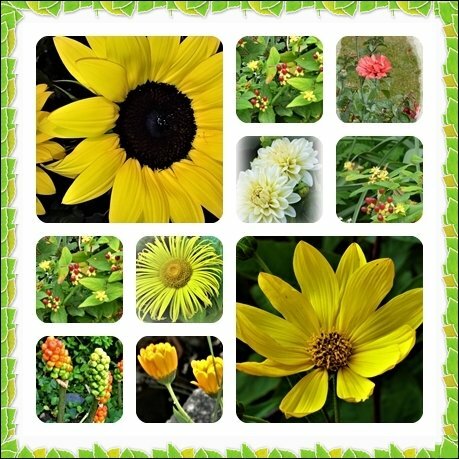 Beautiful collage, shots and flowers. Lots of lovely bright yellows. @sangwann Ha ha ! thanks Dione - I never thought of Geraint Thomas when I was assembling this collage !!! The flowers in the UK just can't seem to win this year can they, but you have found some beauties. You have managed to create a beautiful collage of your survivors. Yes well done your Welsh hero Beryl! Still lots of flowers to photo in your garden but you will be worried about some of your plants. Beautiful yellows from your garden! A beautiful collage and great framing. Lovely flowers captures. Fav. Beautiful collage. My garden is struggling too. That’s a lovely set of images Beryl. Even when the garden doesn’t look it’s best on a large scale it’s amazing what you find when you look close up. @susiemc Exactly Sue , there are some scattered around but nothing on mass a lot of the perennials are going over so early !